Should Romney Go Left on Wall Street? 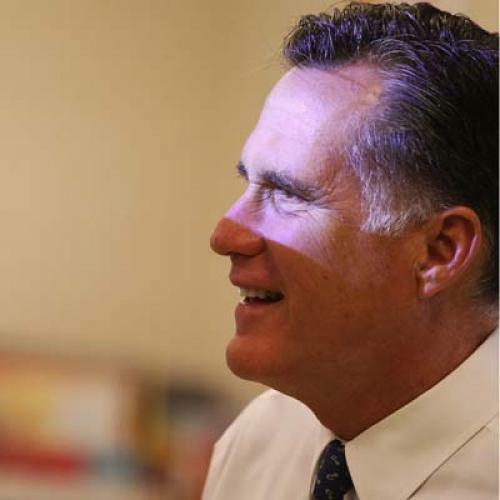 In one fell swoop, Romney would undercut the charge that he’s a creature of Wall Street and the financial superelite. And given how many hedge fund managers and other investment pros dislike the mega-banks, Romney probably wouldn’t even take a fundraising hit. At the same time, he would outflank Obama on the financial reform issue by portraying Obama-Dodd-Frank as a sop to the big banks that failed to fix the problem. As for the new federal regulations for banks and other financial institutions put in place during the current administration, few voters—about one in four—say they have struck the right balance. About 25 percent of all voters say the regulations “go too far,” while 39 percent say “not far enough.” Most Democrats say the new rules are not sufficiently tough; among Republicans, twice as many say they are unnecessarily restrictive compared with those saying they are too lenient. Independents tilt in the “not far enough” direction [emphasis added]. The news of J.P. Morgan Chase’s recent trading loss has raised the cry of ‘I told you so’ from proponents of the almost 2-year-old Dodd-Frank Act. They say the law’s Volcker rule would have prevented such a loss and that without more regulation, financial institutions will continue to make poor investment decisions. ... Unfortunately, Dodd-Frank codifies TBTF into federal law. Since its passage, the big banks have become larger and the small banks have become fewer. As a nation, we would do well to rethink TBTF’s fundamental premise before it’s too late. In the end, this strikes me as the kind of risk a rational candidate would take if he were the underdog, but not if he thought he was going to win. So perhaps the simplest explanation is that Romney increasingly likes his chances.